This argument presumes mistakenly that God is the explanation for the unexplainable. But Gita wisdom explains that God is the explanation for explanability – he underlies the various causes whose interactions science discovers through its advances. If, as atheism would have us believe, the world is a product solely of matter arising from an explosion, there’s no reason that it should work according to laws – and certainly no reason that those laws should correspond with our human faculty for comprehension. After all, within the reductionistic, materialistic worldview espoused by atheism, our comprehending something is nothing but a change in the electrochemical states of brain cells, which are nothing but concatenations of atoms and molecules. Thus, atheism can offer no intelligible reason why we should be able to acquire any knowledge about nature at all. The Gita (15.12-14) indicates that God sustains the natural order that maintains the outer world. 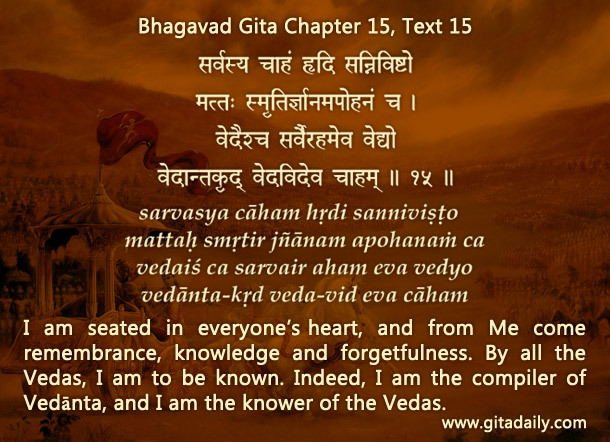 And the Gita (15.15) indicates that God gives us knowledge. Thus, through his outer arrangement in organizing nature and his inner arrangement in organizing our intelligence, he enables us to gain knowledge. Scientific advances that unravel the complexities of nature become testimonies not to his redundancy, but to his brilliance – we appreciate increasingly his supreme intelligence in setting up such a self-sustaining system for cosmic administration. Indeed, the more the gaps in our knowledge are filled, the more we perceive the reality and indeed the necessity of God. Thus, God is needed not to fill the gaps in our knowledge but to explain our capacity to acquire knowledge itself. Fantastic explanation as this area than most is used by atheists to further their cause.